Officers forcing their way into the property. Photo by Cleveland Police. Information passed on to police led officers to break down the door of a property in a drugs raid. Members of the Hartlepool Community Safety Team, along with the Operational Support Unit, executed a Misuse of Drugs Warrant in Westmoreland Walk, Hartlepool. 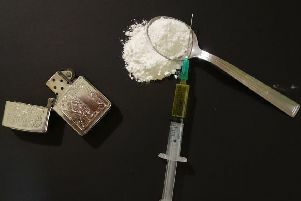 A spokesman for Cleveland Police said: "This is in response to information received from members of the public and reinforces Cleveland Police's commitment to tackling drug problems in the town. "No drugs were recovered in the operation and no arrests were made, however, the housing association are looking into tenancy issues. "If you would like to report issues with drug related activity you can contact police on 101 or anonymously via Crimestoppers on 0800 555 111." The operation was carried out by the force yesterday morning.